Did you know eating outside is a natural mood booster? Join us for the lunch hour and boost your mood! 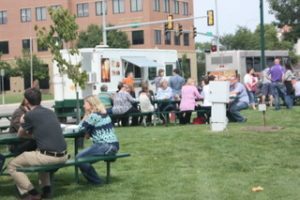 On the fourth Fridays each month purchase a meal from a local food vendor while sitting back, relaxing, and enjoying entertainment. Price of food set by vendors. Weather permitting.